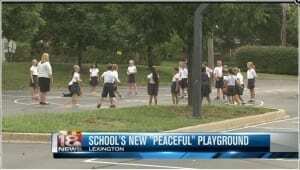 LEXINGTON, Ky (LEX 18) Some Lexington students are kicking off the new school year with a brand new playground. The new playground at Mary Queen of the Holy Rosary School is a series of diagrams painted on the blacktop of a parking lot. It includes popular kids games like 4 Square, 21, bean bag tosses, and Hopscotch. The peaceful playground is designed to teach students while they are having fun. It teaches teamwork and that children should work together. “We wanted to have some games that they kids could play with the same rules so that they would all learn the rules together, be able to play together peacefully, learn how to get along,” said principal Rebecca Brown. Brown said that it teaches conflict resolution as well. “If they’re learning at a young age how to solve problems together, just think of what a much better world it’s gonna be as adults if they’ve already learned those skills and are going to be able to solve conflict together,” said Brown. She says that the playground is also teaching anti-bullying because no one is allowed to be excluded. “I just got to this school like a couple of days ago. It’s my first time being here and it’s helping me know my friends a lot,” said third grader Boothe Breadsley. The playground was gifted to the school as a donation from a parent, a group of more than 50 parents volunteered this summer to come out and paint it onto the school grounds.